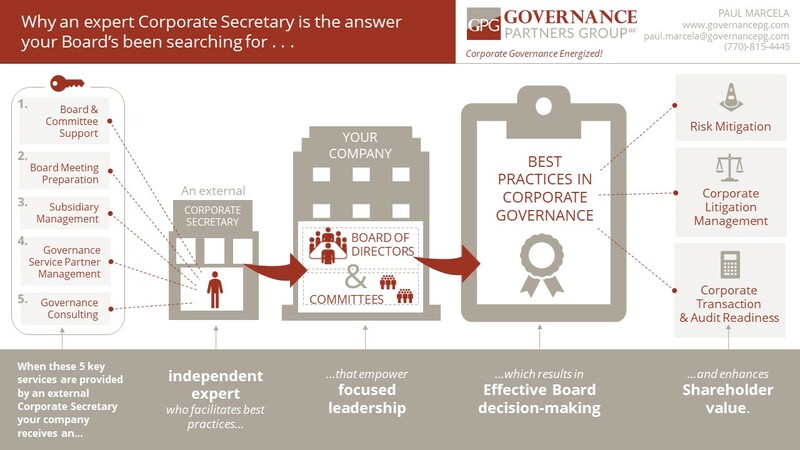 GPG provides a full range of external Corporate Secretary and related corporate governance services to Boards of Directors and executive management of corporations and other organizations that have a need to practice good corporate governance but which may not have sufficient internal resources to practice good governance in an appropriately robust manner and, therefore, prefer to retain an external expert to perform all or a portion of their Office of the Corporate Secretary functions. We offer a modern solution engineered to meet your company’s unique corporate governance needs and deliver a wide range of high quality and flexible external Corporate Secretary services with personal attention and the confidentiality that you need at a reasonable cost. Our professionals are available for any type of project, including providing external support during peak periods, when identified projects require special skills or after a company’s corporate governance professionals may have left the company. We leverage our relationships with governance service partners to provide a full complement of customized services.